That’s what Jeffrey’s late mother used to call Ohio. She and Jeffrey’s father met at Ohio State. But for Ohio, there would be no Ride for Human Rights. Today we rode 90 miles from Fremont to Montpelier. Montpelier is near Burlington. Sounds like some Vermonters migrated to this area way back when. All that riding, against fierce headwinds, through two rainstorms and a hailstorm, over numerous railroad tracks and among green, tan, and muddy brown fields, didn’t leave us time to hobnob with the locals. So today we’ll leave you with a few visual highlights … and some thoughts. This silo is west of Fremont. 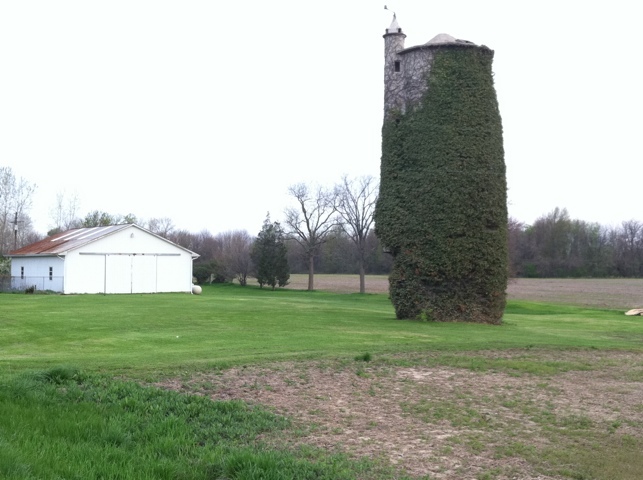 Almost obscured by the ivy is a little tower that makes the silo look like Rapunzel’s tower. Jeffrey couldn’t resist the whimsy. 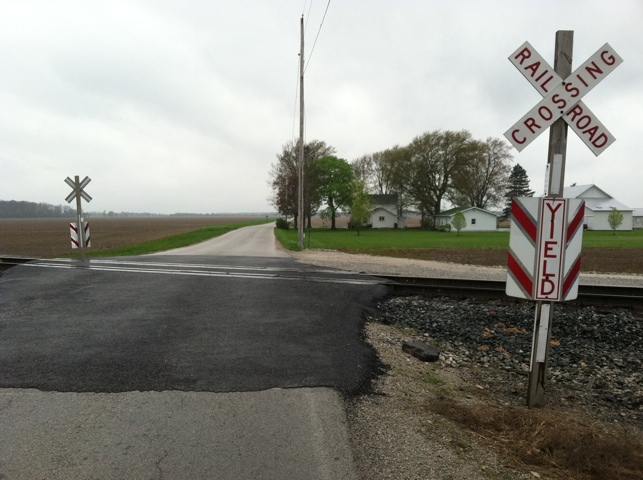 This photo, taken in the rain, shows one of many ungated railroad crossings we traversed today. Freight trains were everywhere. 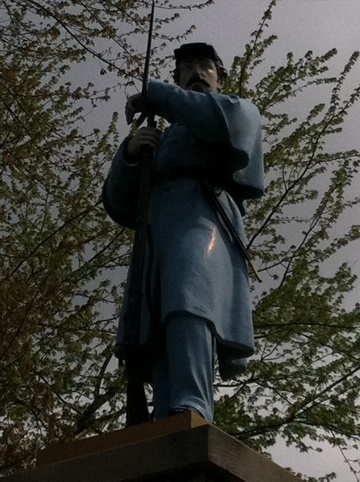 We saw many Civil War monuments. This one, in White House, is unusual because the statue is painted. Jeffrey had a baked potato with his dinner. “Sour cream?” asked the server. “No thanks,” said Jeffrey. 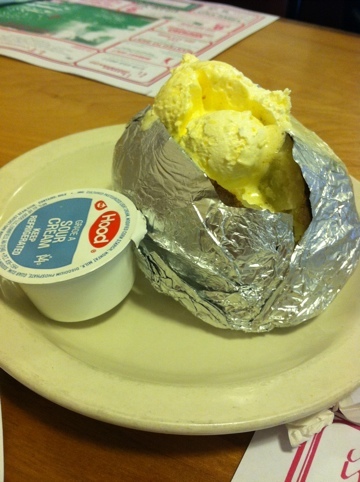 You see what came: a potato with almost as much butter as potato, and a tub of sour cream too. Even when you don’t want it, in rural Ohio you get it. And fast! There was a time when Ohio was considered The Typical American State for marketing research and survey purposes. Maybe it still is. From farm to town to suburb to city, there is something of everything in Ohio. And it’s all accessible. You can see it in that baked potato. The potato is cheap. It was included with Jeffrey’s inexpensive dinner. It’s nutritious alone; with butter and/or sour cream, it becomes a rich delicacy. So this cheap item, this food for the poor, is a veritable feast when done up American style. Ohio is a feast. We saw huge fields, luxurious houses, vast industrial complexes. There was plenty of everything, and room for everyone — woods, fields, abandoned buildings waiting for someone to think up a use. We were passed by lots of rattletrap cars, the potatoes of the road, cheap but they do the job. (And like potatoes, many of them lack proper mufflers.) Here, even the poor have cars and can get fat from free butter and sour cream on their free-with-dinner potato. Ohio is largely empty. People here don’t have to get on one another’s nerves. They can do their own thing and stay out of each other’s way. And it’s rich; there’s enough for all. With those ingredients, many things that at first look like problems, such as newcomers who want to live and work and create more wealth, turn out to be no problem at all. And if Ohio is The Typical State, as goes Ohio, so goes America. This entry was posted in Bicycle Touring, Human Rights, Immigration and tagged baked potato, Civil War monument, Ohio, railroad crossing, silo by Joey. Bookmark the permalink.